In this issue, we celebrate a momentous occasion, report on a new exercise machine, and bring you the latest news from ICORD-O. Plus: we tell you about some new research studies, and share some news from our partners. To celebrate the researchers, clinicians, and community members who spend their time in the BSCC, we interviewed athlete and PARC participant Kirsten Sharp, ICORD grad student Amanda Lee, ICORD Director Dr. Wolfram Tetzlaff, Spine Urology Registered Nurse Teresa Lim, donor David McLean, RHI Senior Developer Eduardo Echeverria, ICORD PI and Canada Research Chair in Spinal Cord Injury Dr. Brian Kwon, and Digital Emergency Medicine Associate Lead Dr. Helen Novak Lauscher. The video was created by Momentum Media Productions. 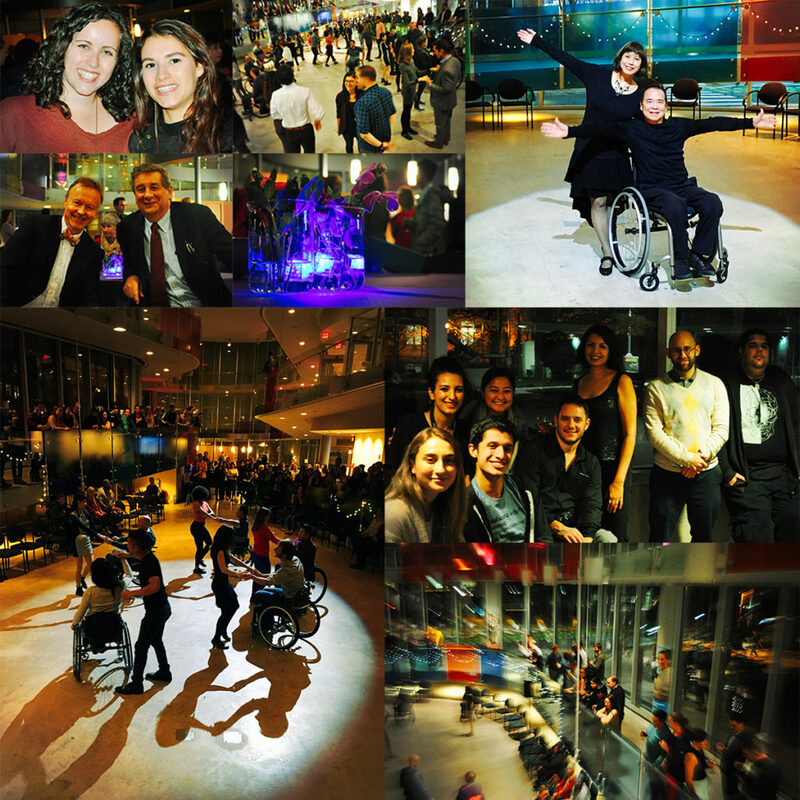 On October 18, we held an official event to celebrate the tenth anniversary of the building. We heard from John Chernesky of the Rick Hansen Institute, Philanthropist Dr. Stewart Blusson, ICORD Founding Director Dr. John Steeves, ICORD Associate Director and spine surgeon Dr. Brian Kwon, before Rick Hansen took the stage to reflect on ten years of leadership and collaboration. Following the formal part of the event, guests visited a variety of displays showcasing projects currently taking place in the building. 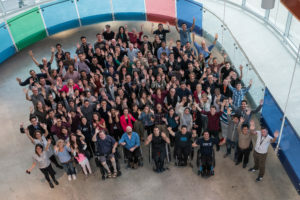 On September 21, photographer Martin Dee came to the Blusson Spinal Cord Centre and took photos of some of people people who work, study, take part in research, and volunteer in the building. Not everyone was here that day or available to have their picture taken, but we still managed to shoot more than 50 people. We also did a giant group photo! Check out this slideshow to see all the individual shots. A hardcover book with all 50 photos plus some lab group shots is also available for purchase through Blurb (at cost – $42.99US). On November 16, we finally celebrated with our BSCC colleagues, with dinner and dancing. We are especially grateful to Dr. Brian Kwon for his contribution towards the event, Tayybeh for the delicious food, Fuse Wheelchair Dance for the performance and mini-lesson, and Promosapien, Bean_VGH, and Tractor Everyday Healthy Foods for door prizes! 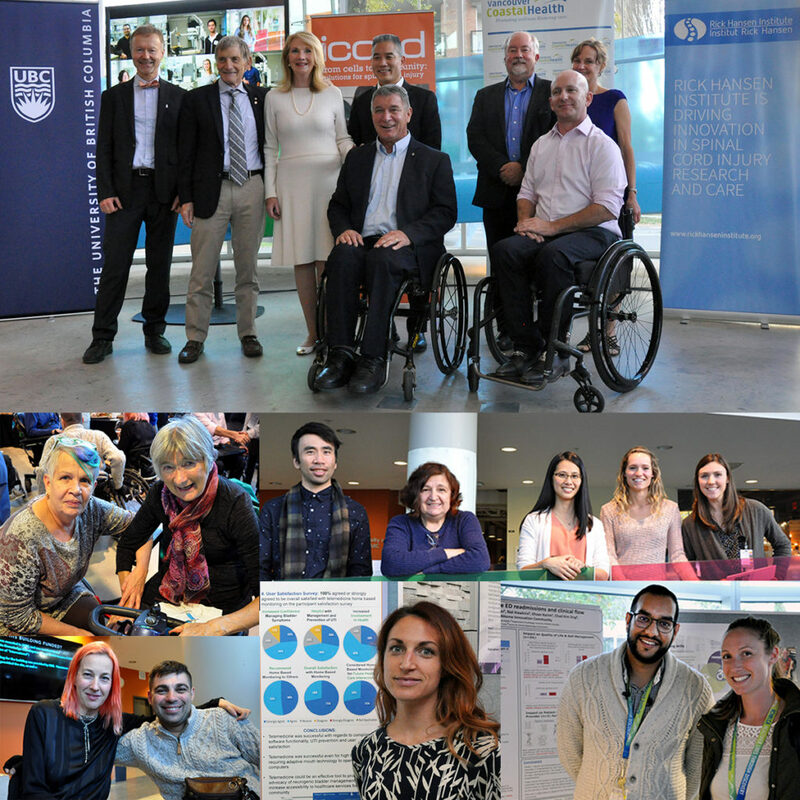 Thanks also to the many staff and students who volunteered at the event, and special thanks to Dean of Medicine Dr. Dermot Kelleher, who took time out of his busy schedule to join us and give a short keynote. Did you go to the party? Please let us know what you thought by completing this short questionnaire. 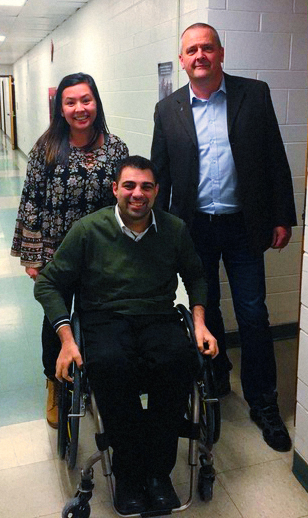 This past summer, ICORD PI and BCIT researcher Dr. Jaimie Borisoff received an Innovation to Commercialization Award from the Michael Smith Foundation for Health Research for the development of AAPLEWalkTM: an innovative exercise machine that could improve health outcomes for people with lower limb mobility issues. AAPLEWalkTM is an exercise machine for cardiovascular fitness and rehabilitation that aims to provide arm-driven, walking-like leg movements while standing and exercising (AAPLE is short for for active arm passive leg exercise). This machine would provide a cardiovascular workout while also stimulating muscles, via standing and movement, in the lower limbs, potentially improving the secondary conditions of multiple diseases. Exercise has been shown to play a major role in mitigating the risks of cardiovascular disease and diabetes in people with SCI. Passive leg exercise has been shown to assist with the recovery of neurological function and improvements in secondary conditions, such as neuropathic pain, as well as improving cardiovascular outcomes, but most accessible exercise machines provide seated upper body exercising only. Currently, therapies that combine upper body exercise with assisted walking movements require expensive machines with trained personnel at specialized rehabilitation centres. Dr. Borisoff and his team, shown right, are hoping that AAPLEWalkTM can provide a better option. With funding provided by the MSFHR grant, he plans to produce an exercise machine suitable for home use—or, with additional features, a device suitable for high-volume use at clinics. If successful, this would be low cost and offer more comprehensive benefits compared to expensive therapy machines currently on the market. With this funding from MSFHR, Dr. Borisoff plans to study AAPLEWalkTM with his ICORD colleagues Drs. Tania Lam and Chris West. Dr. Borisoff’s MSFHR proposal incorporated data generated by an ICORD Seed Grant-funded pilot study. The seed grant, awarded in November 2014, was funded by the BICP, and Drs. Lam and West were co-applicants on this grant. We’re happy to announce that the process of installing automatic door openers to the Tetra Workshop and into the yoga room at PARC is well underway, thanks to a Rick Hansen Foundation Accessibility Grant. 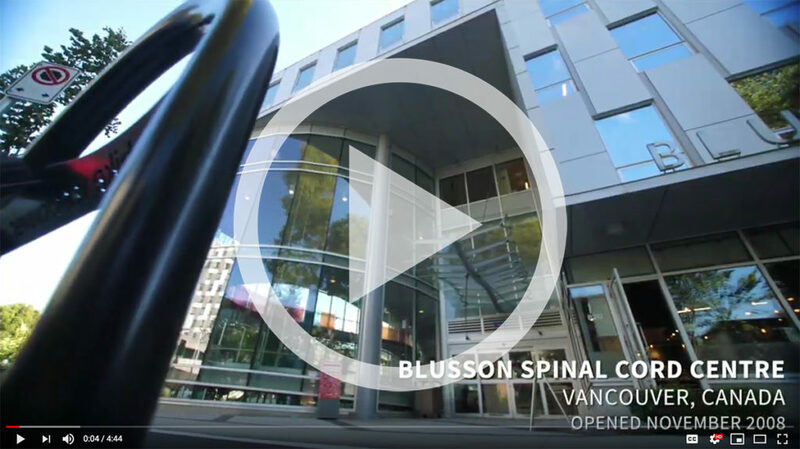 This will make the Blusson Spinal Cord Centre even more accessible! Congratulations to Emily Giroux, UBC Okanagan alumni and former student of ICORD PI Dr. Heather Gainforth, who won this year’s MITACS Outstanding Innovation Award in the Master’s Category. With the support of a MITACS Accelerate Grant, Emily and Dr. Gainforth worked in partnership with the Ontario SCI Alliance to co-develop a method that would allow for the Ontario SCI community to come on consensus on research and implementation priorities in four key topic areas: primary care, neuropathic pain, bladder management, and pressure injuries. Findings from Emilly’s survey were used to inform the direction of the Ontario SCI Alliance’s three-year strategic plan. Emily (pictured right, with Mr. Peter Athanasopoulos and Dr. Stuart Howe) accepted the award at the 2018 MITACS Awards Ceremony in Ottawa, Ontario on November 27. ICORD Principal Investigator Dr. Andrei Krassioukov will host the 5th International Autonomic Symposium on February 13, 2019 at the Blusson Spinal Cord Centre. The symposium, Women’s health after spinal cord injury, will examine the latest advances in research and clinical management of women’s health issues after SCI (sexual health, pregnancy, breastfeeding, spasticity and aging concerns such as osteoporosis and menopause). Researchers in Dr. Peter Cripton’s laboratory want to understand how people activate their neck muscles, and how the activation affects spinal posture right before head-first impacts. Able-bodied participants are being recruited for this study. Click here for more information about this study. For many people with spinal cord injury, a powered wheelchair can make a difference in mobility. This can be seen both indoors and outdoors. Wheelchair skills training is an important part of learning to use a powered wheelchair safely for taking part in daily activities. The purpose of this pilot study in Dr. Bill Miller’s lab is to evaluate a powered wheelchair training program that is designed to improve training for new powered wheelchair users. Click here to learn about all the ICORD studies currently recruiting participants. Did you know that volunteers at our SCI Community Resource Centre prepare summaries of scientific papers and post them on our SCInfo blog? If you’re interested in what’s going on in SCI research around the world, this is a good place to look. SCI-BC’s Lower Mainland Peer Holiday Party happens on Saturday, December 8 from 6–9 PM at the Blusson Spinal Cord Centre. There will be hors d’oeuvres, drinks, door prizes and live music. For those interested in attending, please contact our Provincial Events Lead, Jenna Wright, at JWright@sci-bc.ca for more info. SCI-BC and Vancouver Coastal Health have launched a web site on living with SCI. Check it out: it’s well-designed and informative! Curious about health research – who does it, who funds it, and how it’s done? Does the idea of being a member of a grant review panel, providing the perspective of a patient or family member, interest you? Then this workshop may be for you! 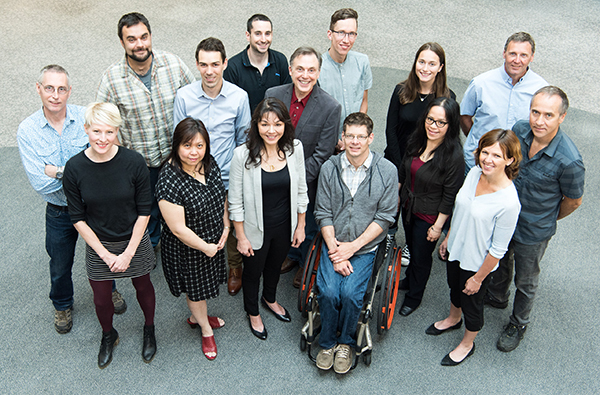 ICORD and the Rick Hansen Institute are working together to identify new treatments for SCI and apply existing treatments for other neurological disorders, injuries and diseases to SCI. 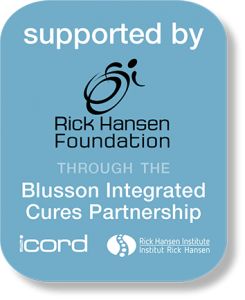 Funded by the Rick Hansen Foundation, the Blusson Integrated Cures Partnership provides ten years of stable funding for several multi-year research projects as well as new faculty positions within ICORD, international exchanges to encourage collaboration, research-related events (like the Annual Research Meeting and seminar series) and a consumer engagement strategy which aims to provide people with SCI and their supporters with evidence-based information about the healthcare, services and resources available to best support recovery after SCI and increase consumer involvement in the research process. We are very grateful for this generous support. 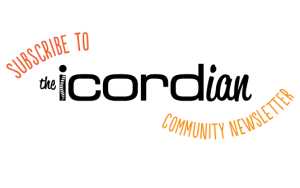 Adam Mesa, Max Thompson, Heather Gainforth, Emily Giroux, and Jaimie Borisoff, for their contributions to this issue of our newsletter. Thanks for reading this issue of The ICORDian – we hope you enjoyed it! Please subscribe and have future issues delivered to your inbox. If you have any comments about this issue or suggestions for future ones, please contact us.